Taking of today's hottest topic - Artificial Intelligence (A.I.). For people who are new, Artificial Intelligence is a machine's ability to think using mathematical algorithms (or logic). It is astonishing to witness the results that we can achieve using machine intelligence, some of which are image-processing, self-driving cars, smarter robots, etc. Although A.I. is a hot topic today, it is in existence since 1956 in Dartmouth College's workshop and no wonder, A.I. is the future. Businesses already started to implementing Artificial Intelligence for various business intelligence to achieve greater business growth, for instance - Chatbots for chatting to consumers and analytics, A.I. for suggesting / recommending products to consumers in an eCommerce, A.I. based virtual assistance for better work productivity, A.I. for detecting vulnerabilities or threat in Cyber Security, and so much more. Artificial Intelligence is slowing changing how we do things in our day-to-day life with machine's intelligence outsmarting humans and other species, even in Natural Intelligence like visual perception, speech recognization, prediction, translation, etc. However, it is scary to note that it is outsmarting humans, however, general intelligence (full A.I.) is still an A.I. 's fiction. The machine doesn't make mistakes and needs no rest, and with an ability to learn and process data (think) it sure adds up to human evaluation. However, with such an ability and intelligence outsmarting humans in many fields there is sure a fear of huge job loss and a fear that such intelligence can be misused. - Strategic Gaming like chess, tic tac toe, etc. - Recognization, filtration and understanding audio/speech inputs. - Visioning Systems for recognizing, understanding and processing visual inputs. - Natural Language Processing to understanding and process human's language. BABY STEP TOWARDS MACHINE LEARNING - HOW MACHINE REALLY THINKS? In simple technical terms, let us try and get a glimpse of intelligence behind Artificial Intelligence taking a simple example of Linear Regression algorithm. Here, I am presuming that you are familiar with graphs and lines in mathematics. Now, if I ask, how much an "Antique Item X" price to if it is 70yrs old, then no wonder you will predict "Rs. 12L" based on the data. That's it. What you just did is intelligence, you went through previous data and calculated the statistics and predicted the result. That is what an A.I. does as well. However, A.I. cannot do that by itself, it requires us (the humans) to teach a machine to think. 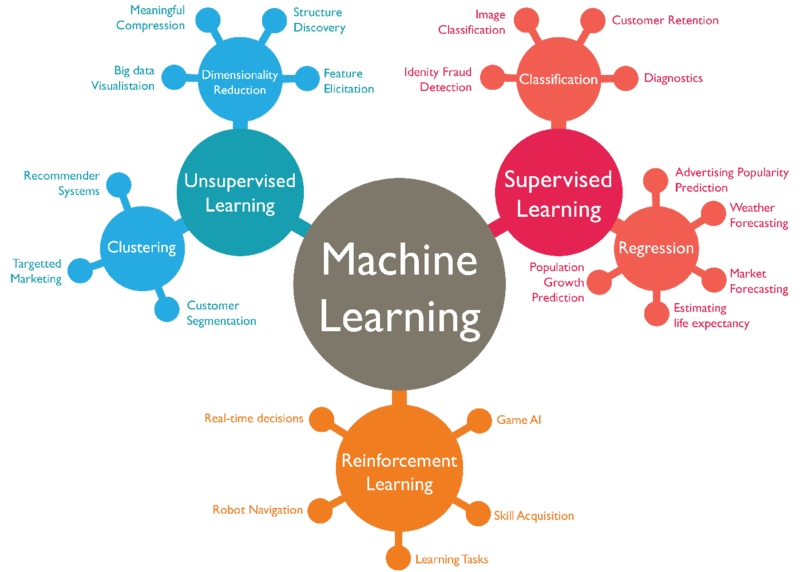 We do that using Machine Learning algorithm or logic, and for the above problem we use a machine learning algorithm called "Linear Regression". Linear Regression is a Machine Learning modal to predict a line (in a graph) that best fits or defines the given data point. So, if an equation of a line is y = mx + b, where 'x' is "Antique Item X (in Years)" and 'y' is "Price", then we need to find the value of 'm' (slope of a line) and 'b' (intercept of a line) that best defines the given data points. Mathematically, if we know the value of 'm' and 'b', then for any value of 'x' we can predict the value of 'y', isn't that it? That's the intelligence we need to program to a machine using Machine Learning algorithm in order to make a no-so-smart machine to an intelligent machine. Machine Learning using mathematical function called Gradient Descent to calcuate the value for 'm' and 'b' by gradually stepping or adjusting the value of 'm' and 'b' towards local maxima (best fitting value for 'm' and 'b') and comparing result with training data points and fixing the resulting error with an error function that determines how correct is the predicted value for 'm' and 'b' is. Or in simple terms, we check to make sure that the calculated value for 'm' and 'b' correctly predicts the training data points and if so, that same value for 'm' and 'b' can be used to predicts other 'y' (output/Price) for any 'x' (input/Antique Item X). May be little hard to grab! But..
Further, if you look forward to learning more or dive deep into machine learning or an A.I., then we would like to recommend you do a little more research on Artificial Intelligence. Then opt to nano-degree courses offered by Coursera or Udemy or even refer MIT OpenCourseWare, and in a meanwhile which is a pre-requisite for learning Artificial Intelligence, learn some programming (Python) basics and brush up your math skills. Artificial Intelligence - Know what machine with mind can do for us! What, How and Why of Cyber Security Threats 101x2019 - Secure Your Cyber Space! Outsourcing Software Development to India - World's No.1 Software Outsourcing Destination! Codigion brings you the up-to-date market technologies to sale up your business by serving your consumers better. Our world-class coders and engineers from around the nation and beyond is serving Codigion in-house and outsourced such that we can deliver efficient, robust and secure software technologies to our valued clients. Do pay us a visit at our Shillong office or reach us for Software Development services.